This account of the opening salvos of the First World War differs from many books based on personal diaries in that it draws on the experiences of three men rather than just one. The three diarists, all officers, played leading roles in the 1st Battalion Northumberland Fusiliers in 1914. The bulk of the book focuses on the reminiscences of Captain Beauchamp Tudor St. John, a pre-war regular, with additional contributions from the diaries of Lieutenant Watkins, the battalion machine gun officer, and Captain Gordon, a Boer War veteran rushed out in October due to the high number of officer casualties sustained. Sneddon examines the history and composition of the battalion and the early political manoeuvrings that led to the deployment of the British Expeditionary Force (BEF), before launching into the battalion’s experiences of the first hundred days. St. John’s journal entries of the early days of the war are comprehensive, and alongside Sneddon’s narrative paint a vivid picture of the desperate close-quarters fighting experienced in their first action at Mons on 23rd August. The battalion were then part of the infamous ‘retreat from Mons’, and St. John’s diary gives a sense of the chaos and lack of communication during this time. The battalion were often in the rearguard trying to stem the German advance and suffered heavily. The war was very much still a mobile one, and the battalion played leading roles in many of the well-known battles of the 1914 campaign – the Marne; the Aisne; and the first actions at La Bassee, Aubers, and Neuve Chapelle. The first portent of trench warfare occurred in mid-September when the battalion entrenched and spent over a week in the same position. Hastily dug positions were improved and fortified to try and offer some protection and comfort for the men. At Neuve Chapelle the ‘trenches’ consisted simply of shallow scrapes and ditches and built up with breastworks due to the high water table in the region. The battalion were rushed north to Ypres after the Germans nearly broke through at the end of October. In action at Wytshaete on 1st November confusion reigned and St. John was hit by machine gun fire as he tried to organise his men. Shot through the neck he was lucky to survive, and his account of being wounded and the casualty evacuation process make for interesting reading. By this stage the battalion was so badly under-strength that the remaining men were incorporated into an ad hoc fighting force, and after being relieved in mid-November the remaining days of the year were spent improving the trenches and trying to cope with the demands placed on them by trench life, a lack of equipment, and the weather conditions. The era of trench warfare had begun. The diary entries speak for themselves and give an indication of what life was like for the soldier of 1914, whilst Sneddon’s narrative is not intrusive but sets the strategic context and fills in the gaps between the diarists’ accounts. What is clear from the book is how the first battles of the war had a major impact on the BEF through the loss of many experienced officers and Non-Commissioned Officers. The narrative is supplemented by many maps and although the quality of some could be better, they do help to visualise the movements and actions being described. 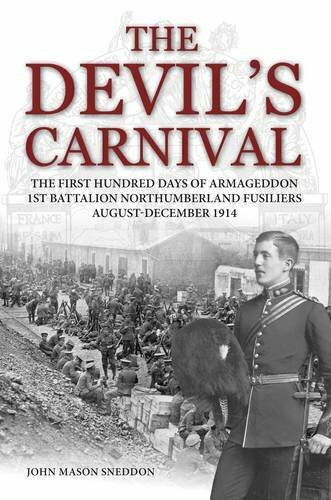 An overall conclusion about how their experiences in 1914 impacted the battalion and the remainder of their war would have been fitting; however this does not detract from what is overall an excellent account of the early days of the war.